reception, safe, elevator. backyard, sunbathing area. loungers, parasol. parking lot. fee payable: bakery service, soda service, washing machine, tumble drier. garage, as available. uniquely and simply furnished to the owner's taste. kitchenette. refrigerator, microwave, coffee machine, kettle, eating nook. shower, toilet. satellite TV, radio, telephone, wireless LAN. heating. studio. living / bedroom, 1 double sleeper couch. 2 electric cooking plates. 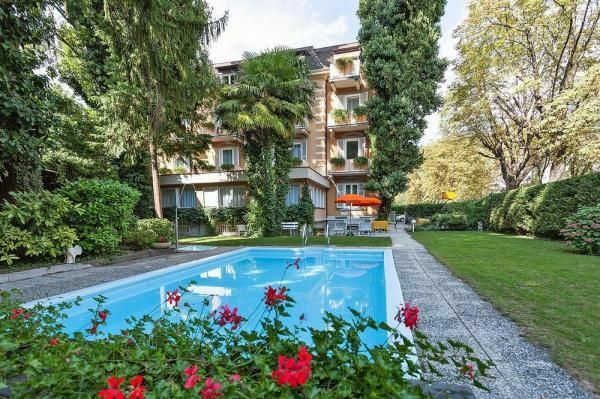 town center 500 m, restaurant 150 m, bus stop 50 m, location Kurzentrum 500 m, golf Lana 9 Loch, Golfplatz Passeier Meran 18 Loch 2.7 km. Also available on site: farmhouse parlour with TV corner. wellness area, sauna, steam bath, quiet room. bathrobes (fee payable). Die Lage ist einfach genial, 10min. zum Bahnhof, 5min. zum Stadtzentrum. In der Wohnung alles, was man braucht, vorhanden. Super nettes Personal am Empfang, das eigentlich von morgens bis abends für die Gäste da ist, wenn nötig. Schöne kleine Sauna. Das Appartement war sauber, komplett ausgestattet und in Ordnung, aber ziemlich klein.